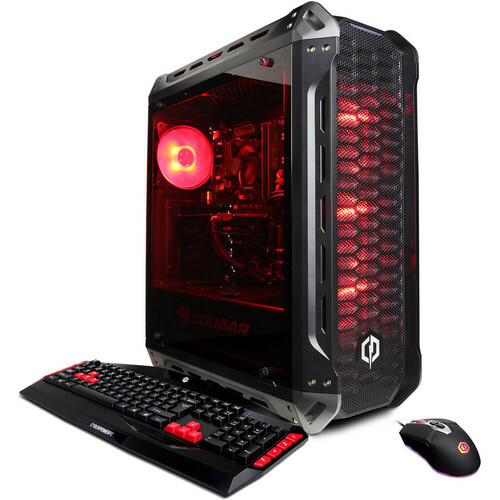 The Gamer Supreme Liquid Cool Desktop Computer from CyberPowerPC is a custom-built system designed for users who want a performance gaming computer with the aesthetics to match. It's powered by a 3.2 GHz Intel Core i7-8700 six-core processor, 16GB of DDR4 RAM, and an NVIDIA GeForce RTX 2060 graphics card. With these combined, you'll be able to easily handle everyday tasks and even play graphically demanding games. To enhance this system's performance even further, you can replace the pre-installed RAM modules with 16GB ones for a max capacity of 64GB. For storage, it's equipped with a single 2TB 7200 rpm hard drive. Should you need more space, you can install additional storage drives or connect external storage solutions using its multiple USB ports. Other integrated features include 802.11ac Wi-Fi, a Gigabit Ethernet port, HDMI and DisplayPort outputs, and audio in/out jacks. The operating system installed is Windows 10 Home, and it comes with a USB gaming keyboard and mouse so you can get started as soon as possible. This system is built within a Cougar mid-tower gaming case and has a 600-watt power supply. Moreover, it features a tempered glass side panel.